These are officially my favorite scones in the whole wide world! Last time we made them with all dried cranberries, so this time we tried them with half dried blueberries. We actually prefer them with only cranberries….the blueberries are almost too strong. This is from “Once Upon a Tart…” Cookbook from the Once Upon a Tart… cafe and bakery in New York City. Cut the butter in 1/4 inch cubes. Combine butter with dry ingredients. Now add the egg and buttermilk mixture. Next mix in the dried blueberries and cranberries with the dough. Form dough into 8 rounds and place them evenly on a cookie sheet. Place in 400 degree oven and bake for 20-25 minutes. Slightly cool and serve warm! Dried Cranberry Scones with Crystallized Sugar Crust. 2. Dump the dry ingredients into the bowl all at once, and run the electric mixer on low for 15 seconds. 3. Add the butter and mix until pea-size clumps form. Be careful not to let the dough form a paste. 4. In a separate, small bowl, whisk the eggs to break up the yolks. Whisk in the buttermilk, and use the whisk to stir in the dried fruit. 5. Pour the wet ingredients into the bowl with flour-butter crumbs. Stir the dough with a wooden spoon until it just comes together and there is no trace of flour visible. You don’t want to work the dough a moment longer than necessary. 6. With a little bit of flour on your hands, scoop out a small handful (1/2 cup) of dough with your hand or a big spoon, and roll the dough until it forms a ball. Drop the dough onto your baking sheet, and press it into a 1 to 1 1/2 inch thick disk with the heel of one hand. Leave 2 inch spaces between the pressed disks. 7. Use a pastry brush and coat each scone with the egg wash. Sprinkle the scones with a thick layer of sugar. 8. Place the baking sheet on a center rack in the oven, and bake for 20-25 minutes, until the tops are golden brown and a small knife or toothpick inserted into the center of one comes out clean. 9. 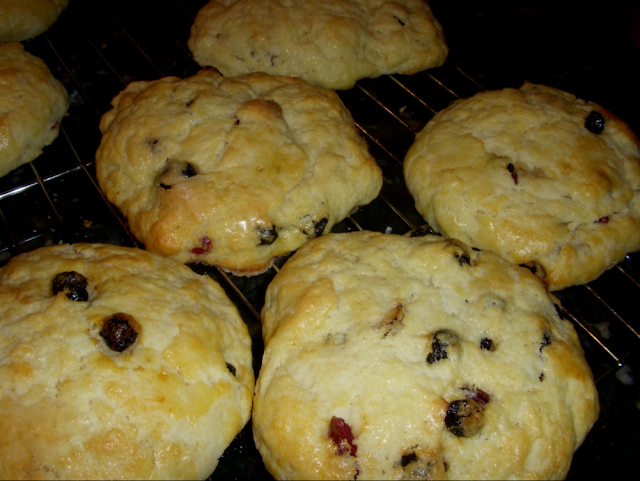 Remove the baking sheet from the oven, and place it on a wire rack to allow the scones to cool for a few minutes. Lift the baking sheet off the rack, and used a spatula to transfer the scones from the baking sheet to the rack, or directly to the dish from which you’ll be serving the scones. Serve fresh out of the oven, or at room temperature.